At the weekend I was chatting on the phone with John Shapcott, who is organising the upcoming Arnold Bennett conference in Stoke, which looks as though it will be excellent. He made a passing reference to a story by Bennett called The White Feather. I have made a small collection of white feather stories, but I had never heard of this one. It turns out to be in Collier’s Weekly (an American magazine) for October 10th, 1914. Today I called up the late 1914 issues of the magazine from the deep cellars of the Bodleian Library. They make for interesting reading. There is plenty of analysis of the war, most of it highly favourable to the Allied side, and condemnatory of German behaviour in Belgium. The hero, Cedric Rollinson, is a twenty-nine year old making his career in manufacturing; he is a responsible man with a wife and children. When war breaks out, his company posts a notice saying that any employee joining the colours will have his place kept open, while the company will pay his family the difference between his soldier’s pay and his salary from the company. Inspired by this, Rollinson hesitantly tells his wife that he is thinking of offering himself as an officer. Used to dealing with workmen, he reckons that he has skills the country needs. I’ve been wondering about it too, dearest. In a moment they both knew that the matter was decided. He must go…. His wife cried and started to prepare things for him. The patriotic Maffick, however, gives Rollison’s suggestion a chilly reception. The firm is willing to make up the pay of manual workers, but not of a manager whose salary is considerably more. He also weasels out of keeping a management position open till after the war. If Rollinson enlisted, therefore, his family would face hardship. He had to choose between his country and his wife and family, and he chose. 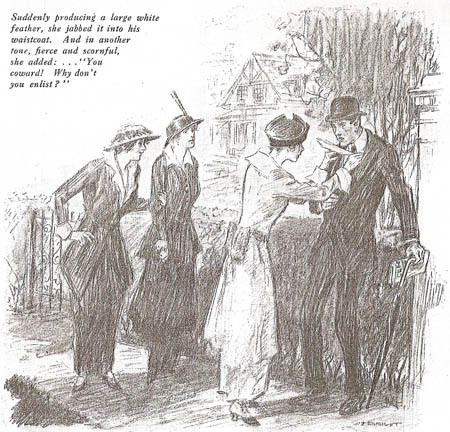 That evening, on the way home, three smartly dressed girls bar his way. One stuffs a white feather into his waistcoat. And off the trio went laughing. This was the latest sport of bright and pretty creatures in London. Bennett’s story is very typical of the white feather tales written at this time. The man wants to enlist, and the women who assume he does not are mistaken and insensitive. Like other authors of the time, Bennett is trying to distinguish between appropriate and inappropriate war enthusiasm. Those who go in for easy gestures (the newspaper advertisements, the white feather) are shown up as shallow in comparison with those willing to make real sacrifices. Lord Maffick, emulating Mr. and Mrs. Maffick, swept his district clean of flour ; let the thing go down to history. Lord Maffick now explains that he bought it to distribute among his poorer neighbours that is going to be the stock excuse of these people but that sort of buying is just exactly as bad for prices as buying for Lord Maffick’s personal interior. The sooner that flour gets out of the houses of Lord Maffick and Horatio Maffick, Esquire, and young Mr. Maffick and the rest of them, and into the houses of their poorer neighbours, the better for them and the country. The greatest danger to England at the present time is neither the German army nor the German fleet, but this morally rotten section of our community. Now it is no use scolding these people. It is no use appealing to their honour and patriotism. Honour they have none, and their idea of patriotism is to ” tax the foreigner,” wave Union Jacks, and clamour for … universal compulsory service. “Mafficking”, of course, had been a derogatory term for excessive patriotic behaviour ever since the riotous celebratory scenes that greeted the relief of Mafeking in May 1900. Another thing that puzzled me more. Clearly this story was written as a message to England. So why is it in an American magazine? Or was there a British publication too? This entry was written by George Simmers and posted on March 4, 2009 at 6:25 pm and filed under Magazines, Short stories. Bookmark the permalink. Follow any comments here with the RSS feed for this post. Post a comment or leave a trackback: Trackback URL. Bennett’s story sounds fascinating. Nosheen Khan argues (in Women’s Poetry of the First World War) that Bennett and his like are being attacked by Helen Hamilton in her poem ‘The Old Man Rampant’: “all raging dotards… chattering, senile folly” should “go, this very day, straight to the front.” Is Khan justified in assuming that Bennett might be the target of this kind of attack? Hamilton also writes a white feather poem, ‘The Jingo-Woman’, denouncing ‘dealer[s] in white feathers’ as self-appointed insulters who ‘shame us women’. I’d have thought that there were much better candidates than Bennett for the title of “raging dotard”. The Bishop of London, for example, who told soldiers to kill all Germans, including children. This story is a plea for sensible, rather than excessive, war enthusiasm. I haven’t read Nosheen Khan, but I wonder whether she is being led astray by the fact that Bennett was associated with Wellington House and the Ministry of Information. Like most people of the time, he fully supported the War effort, while being aware of its cost. His portrayal of the traumatised soldier in “The Pretty Lady” is very far from being unthinking pro-war propaganda. I’ve now found the Nosheen Khan reference (thanks to Google Books). She classes Bennett among the utterers of “chattering, senile folly” on the basis of a journal entry in which he wonders why “young men idling in the lanes on Sunday” are not at war. What makes Bennett a very good realist novelist is that he always has a firm grasp on the economic realities of his characters’ lives. In this anecdote, and in the White Feather story, he is showing how financial family responsibilities prevent men from doing what their ideals might inspire them to do. In my book, he’s definitely not a “raging dotard”. Ronald Blythe ‘The Age of Illusion: Some Glimpses of Britain Between the Wars 1919-1940’ (Oxford: OUP, 1983), P.5. Blythe’s comment, that after Passchendaele “There was a noticeable decline in the recruiting figures” does not make any sense. Conscription had been introduced a year earlier, and so voluntary enlistment was a thing of the past. There was indeed a drop in men entering the Army, I think, but that was because the available pool of manpower was drying up. I’m not sure that he has got it right about white feathers, either. 1914 seems to have been the peak time for white feathers, though doubtless the custom continued on a smaller scale in later years. Many men in reserved occupations, and those who had attested but had not been called up yet wore armbands to show that they were not shirkers. I think you’re right, George, on both points. The passage caught my eye because I have been following your discussion of the White Feather phenomenon, and it seemed to me as I read that both assertions were pretty dubious (even with my limited knowledge). I’ve found the book enjoyable so far, but have to say that the first chapter did seem a bit overblown and flowery – those dubious assertions above are symptomatic of a general problem with the opening chapter. I’ll let you know how the rest of it is. I have a feeling that Bennett’s short story was first published in the Saturday Westminster. Sept 19, 1914 pp. 13-4,then reprinted by Colliers. Thanks very much for that information. British publication suits my thesis much better! Yes, it makes more sense for it to have originated in England. But you touch on an interesting point. Bonar Thompson “a professional agitator” according to a police report, has an account of ‘white featherism’ from the recipients point of view in his “Hyde Park Orator”. I wonder whether Bennett’s story had an influence in spreading the phenomena. was a far more complex issue than we are often led to believe. One recent publication, A.Gregory, “The Last Great War” has some interesting thoughts on this.